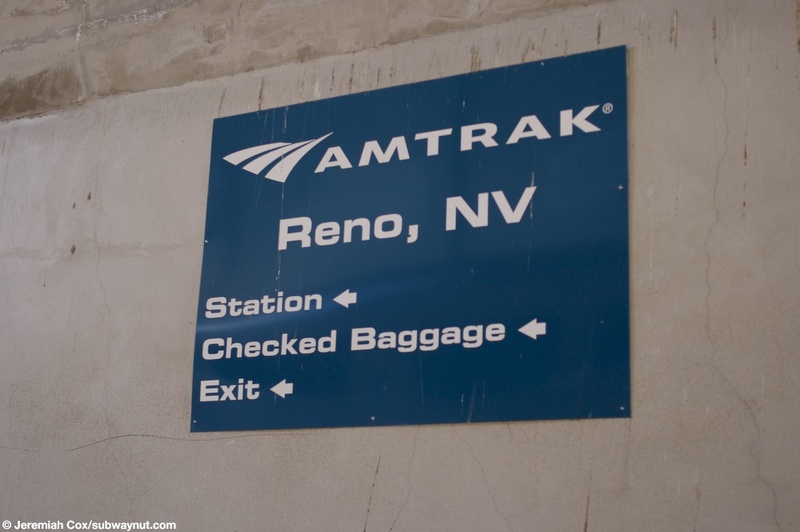 Reno, NV is definitely one of the strangest Amtrak Stations I've been to. 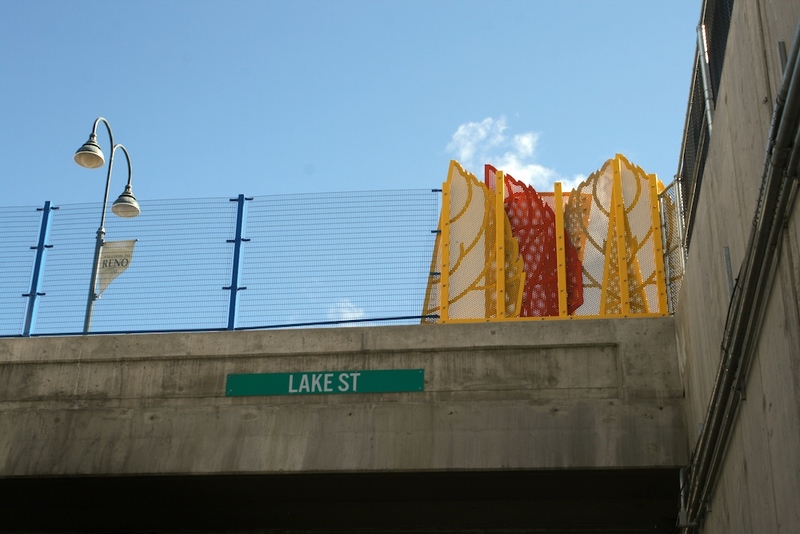 It is located in a concrete trench in the center of town. 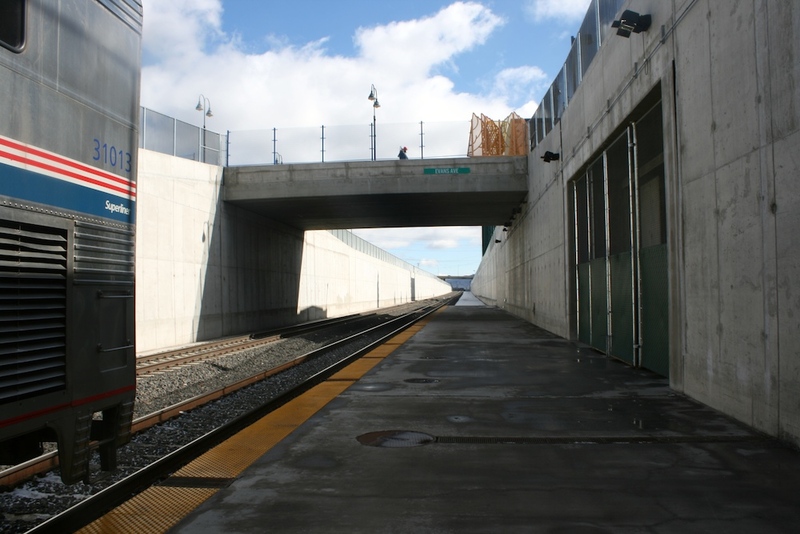 The station platform is simply an area where a tactile warning strip begins along the six-foot area at the side of the two-track trench. 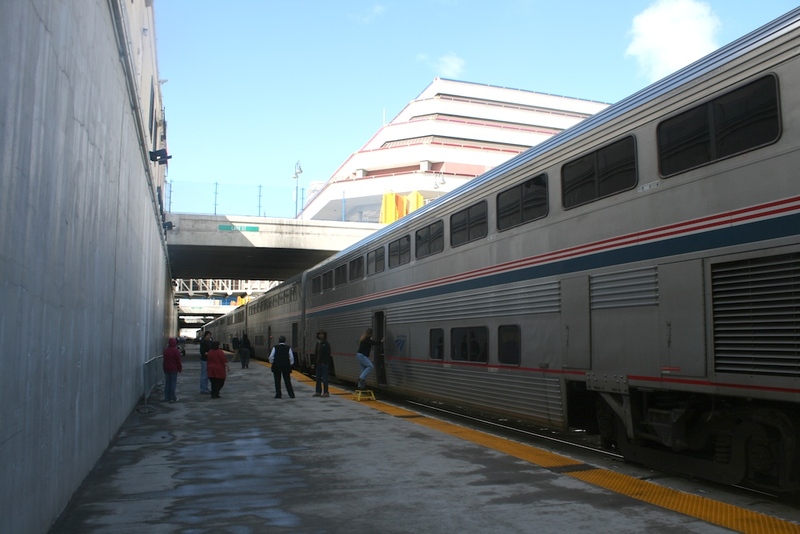 The stop has service from the daily California Zephyr that has brisk ridership on passengers doing just the day trip from Reno to Northern California. It is also a fresh air/smoke stop and crew change point. 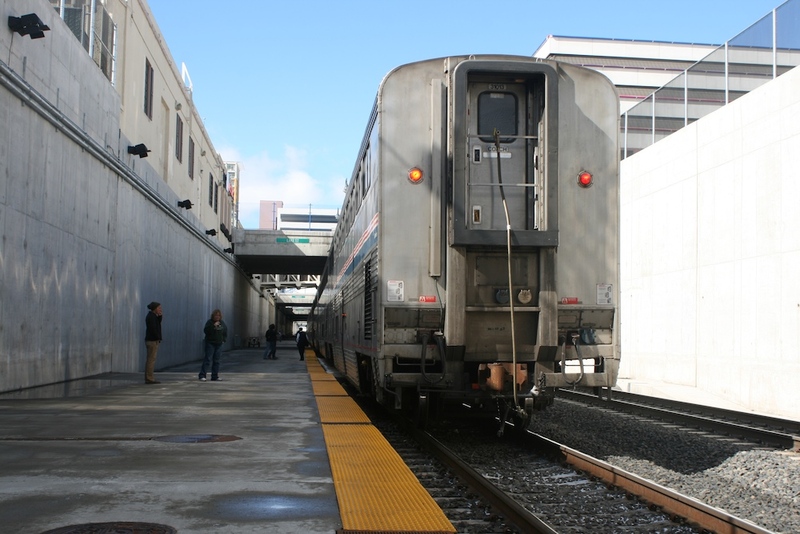 Amtrak Thruway Buses to Sacramento (connecting to the Capital Corridor) also serves the station The unique trench situation hasn't always been the case; the concrete trench putting the track below ground was the Reno Transportation Rail Access Corridor and the trench only officially opened on November 22, 2005. This resulted in the current below grade platform being built. The trench was built to kick trains off of blocking downtown streets every time they pass through down. 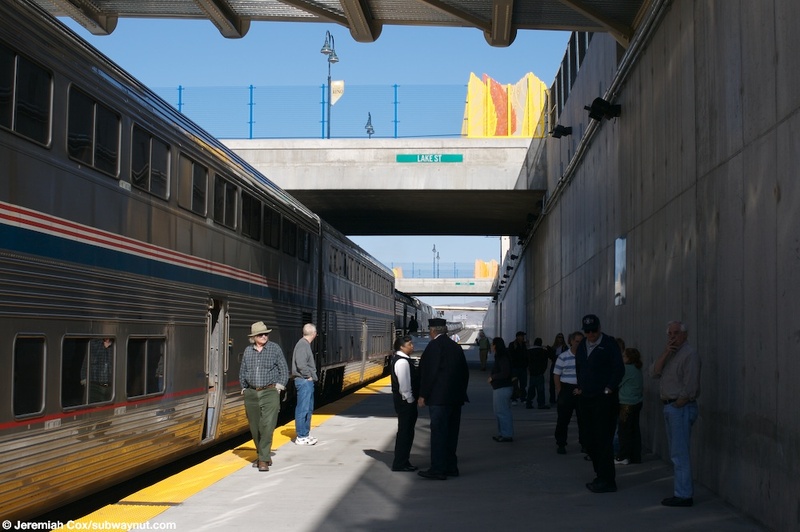 To leave a train in Reno a passenger exits to doors to a lower-level modern waiting area with modern seating but a historic relocated fountain in the middle from the women's temperance movement. Baggage must be claimed on this level. 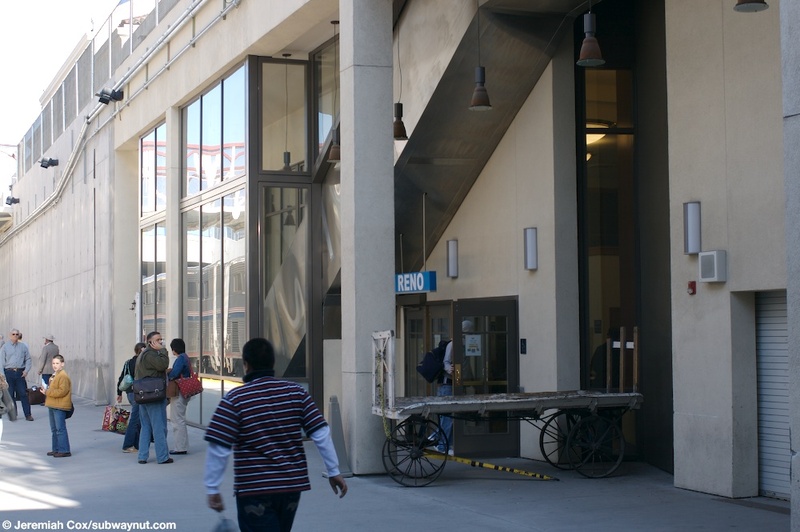 A staircase (via an intermediate upper mezzanine), an escalator that is behind a closed gate (where a mobile lift is as well) and two elevators, one for passengers, one for service only leads up to a modern wing of the upper level depot. 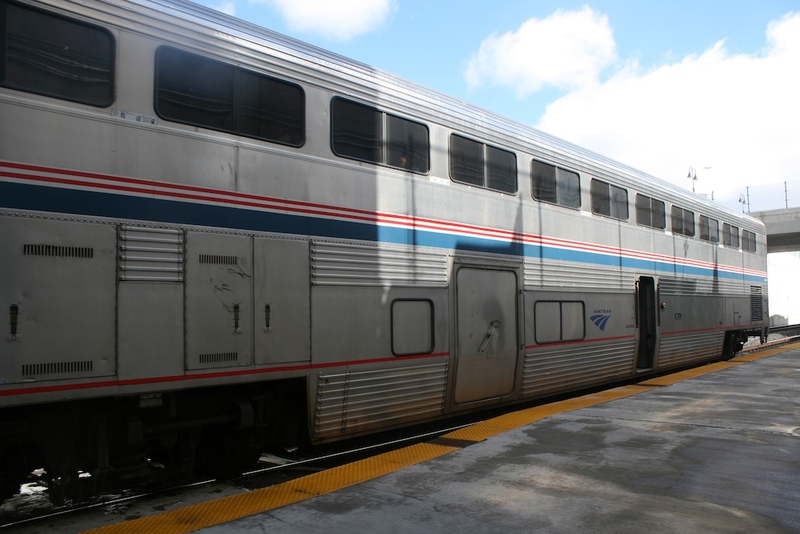 In this wing is where the Amtrak ticket windows are found. 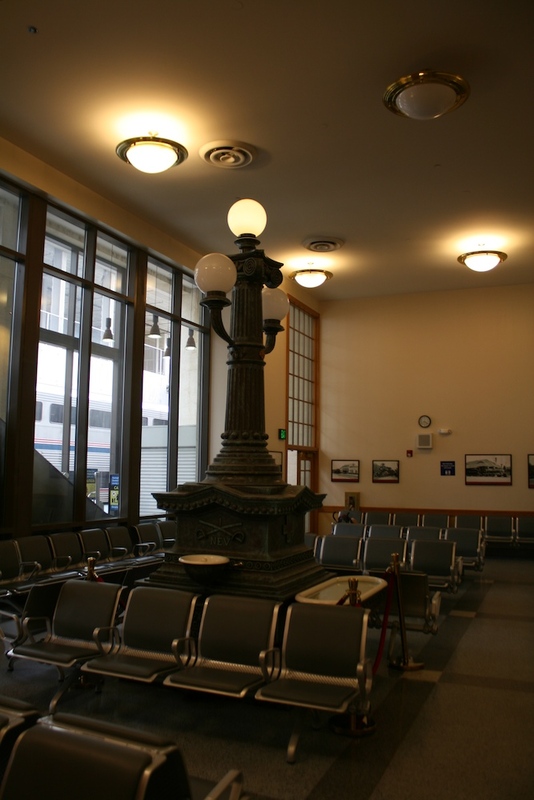 It is attached to the historic and renovated 1925 SP Station with its historic wooden benches. 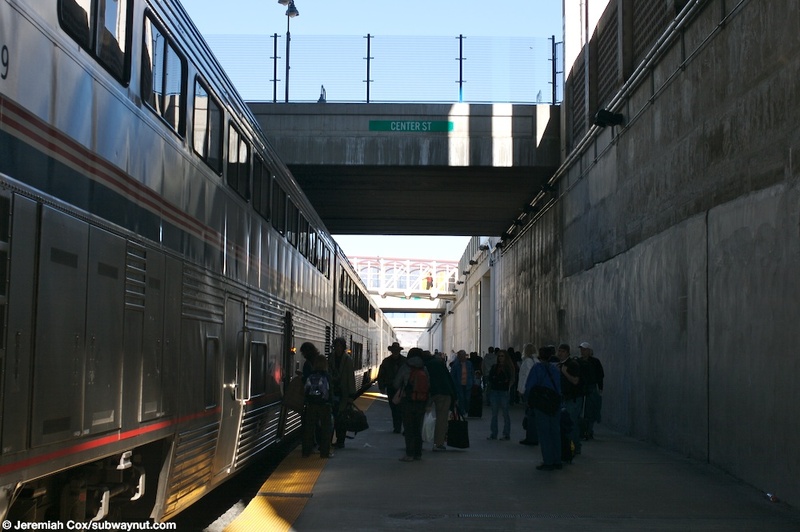 The upper level portion of the station runs from Lake Street to Center Street along Commercial Row. 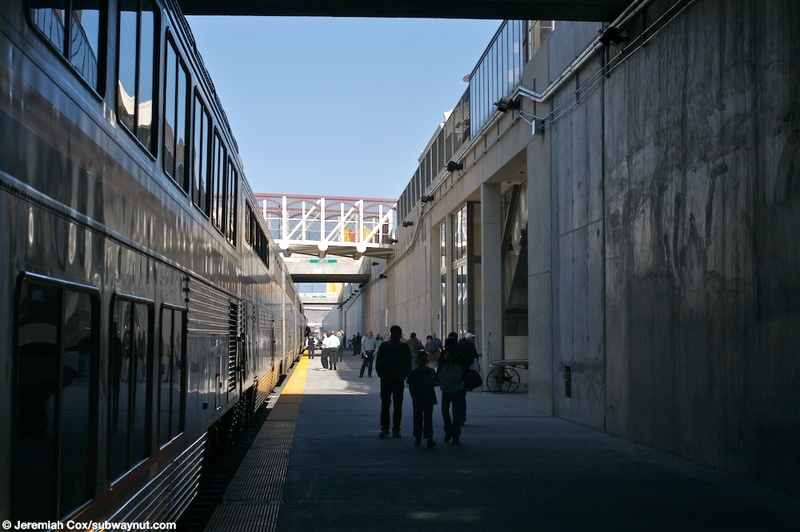 The conductor helps a baby carriage off of the last Car of the Eastbound California Zeyphr. That entire car was completely full and reserved for passengers going to Reno only. 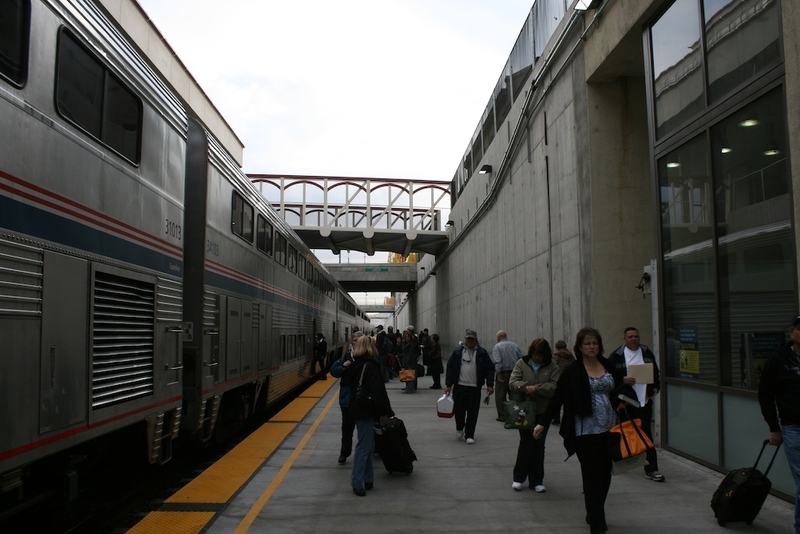 Passengers get their first breaths of fresh air since they boarded the California Zephyr at the strange Reno Amtrak Station in a concrete trench. 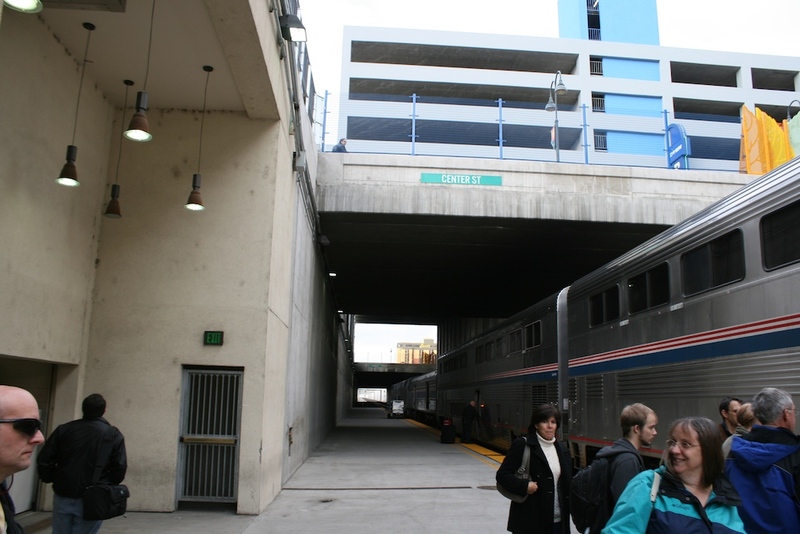 The overpass above here is Center St.
A platform sign on at Reno, NV, on the bare concrete wall, all arrows point to the same place since the only station exit is from the station building since the station is in a trench. 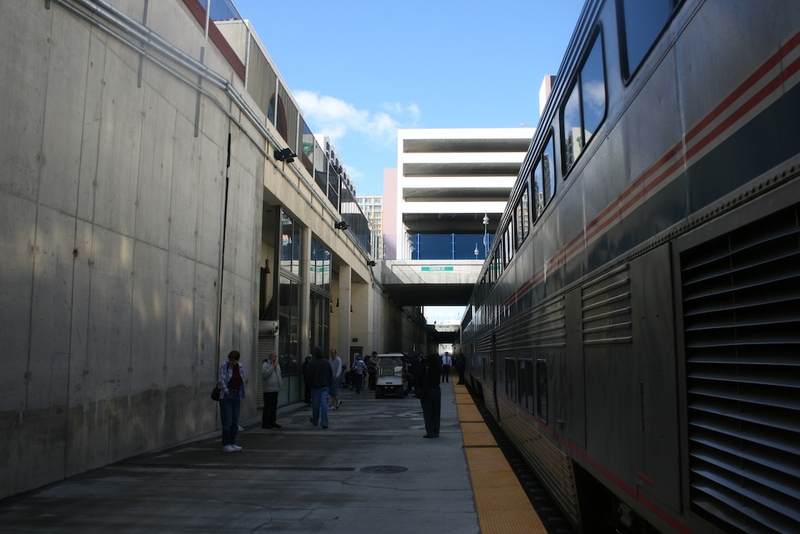 Looking down the platform at Reno, NV the station building with the stairs and escalator to street level is visible. A close up view of the station house that's built directly into the trench and has lots of glass overlooking the tracks at Reno, NV. 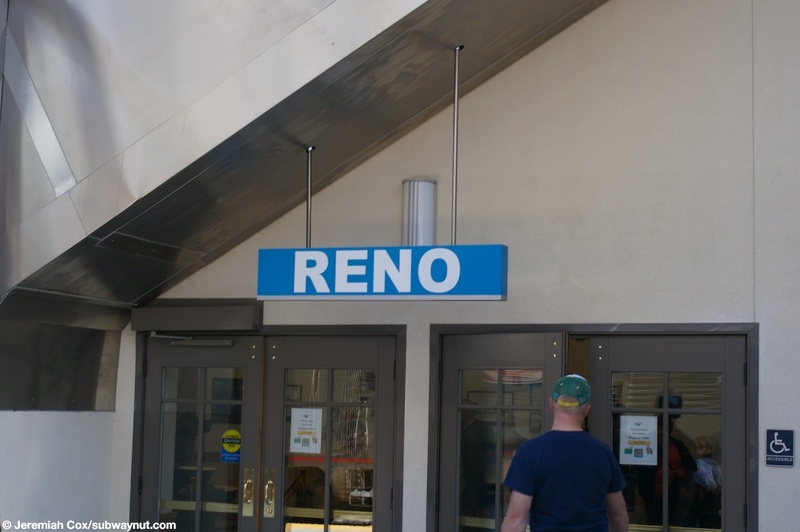 Another Reno Sign. 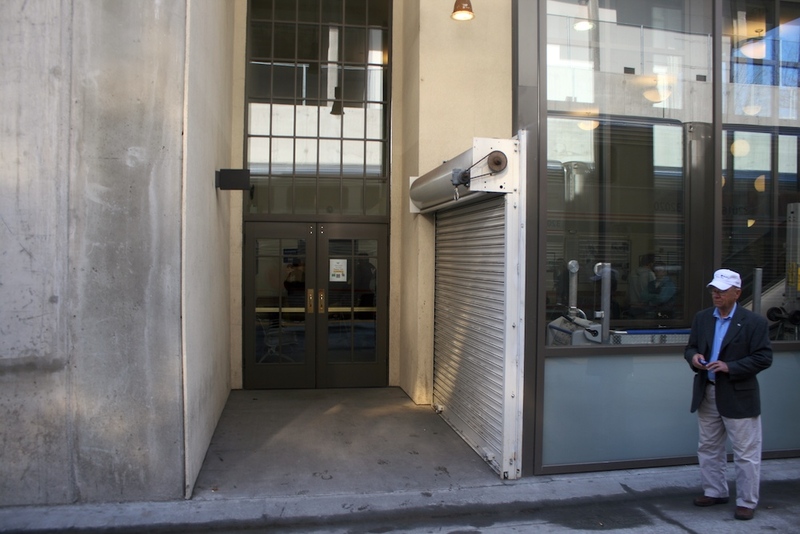 This one is directly above the doors into the station where the stairs escalator and elevator are for access to street level. 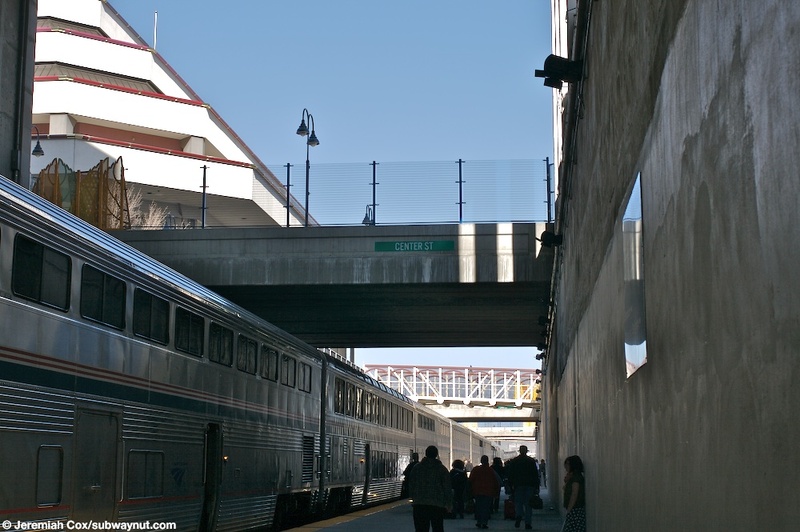 Anoter view down the wide bare platform at Reno, NV. The front of the California Zephy is visible as it has a smoke stop. 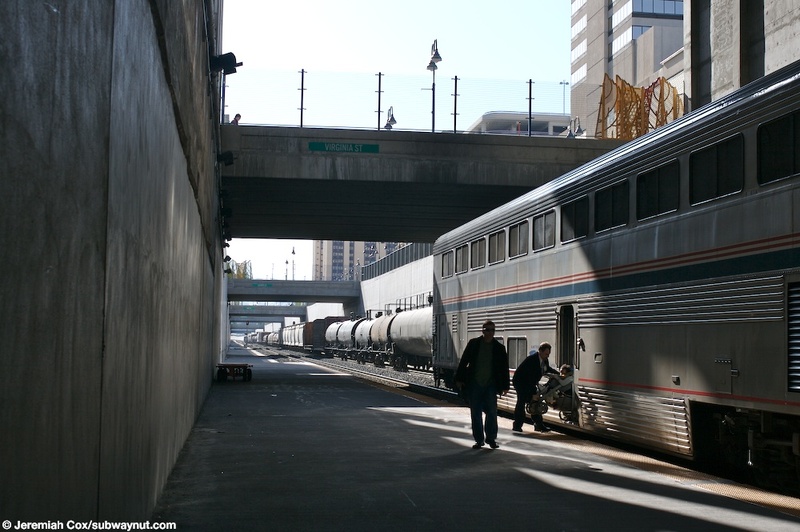 Heritage Baggage Car #1132 of the California Zypher is loaded and unloaded at Reno, NV. 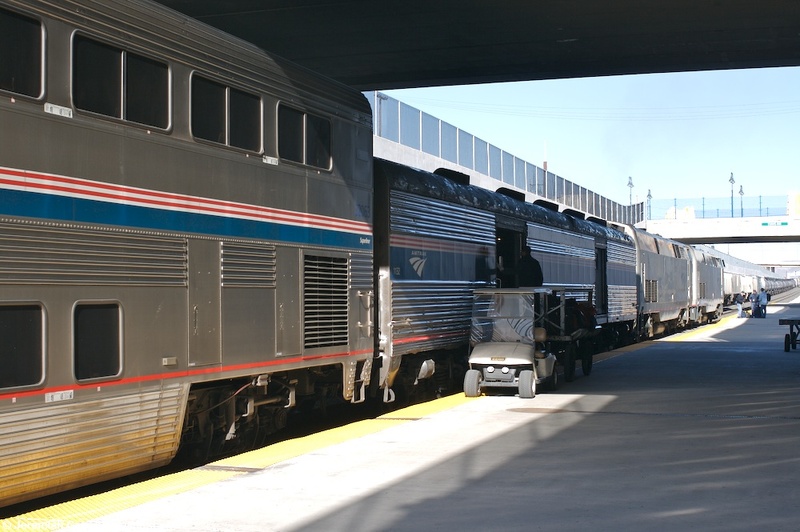 Superliner Sleepers #s 32057 and #32045 of the California Zypher stopped at the strange trenched Reno, NV station. Looking up and out of the trench at Reno, NV, the tops of some buildings are visible.